The Years With Ross: John R. Roach early in his career as guard of Toronto’s NHL nets. would be followed up, and challenged, by subsequent lists from Heineken, Moosehead, Kokanee, and Sapporo, and thereby justice would be done for Dit Clapper, Aurèle Joliat, and Frank Nighbor. How would Home Hardware have done it differently? Included Greg Terrion, maybe, and Pete Langelle at the expense of (maybe) Gus Bodnar and Ed Olczyk? Impossible to say. These lists, as I’ve noted already, are monuments to exemplary players, no more than that: admirable, arbitrary jumbles of skill and achievement, with next to no science to them. I’m all for them, if only for the opportunities they open up to agitate about their content for many winter weeks to come. The NHL list, which isn’t ranked, was compiled by a Blue Ribbon Panel (capitals theirs, or maybe Pabst’s), 58-members strong. This eminent assemblage included retired players (Ken Daneyko, Guy Carbonneau) and legendary coaches and managers (Scotty Bowman, Harry Sinden), many broadcasters and print journalists (Pierre McGuire, Stan Fischler), an owner (Jeremy Jacobs), and NHL brass (Gary Bettman, Bill Daly). Everybody voted for 100 players, with each vote counting for one point. The Leafs’ conclave of 30 counted mostly journalists, broadcasters, and writers. No players took part, though long-time Leafs’ equipment manager Brian Papineau did, along with the Leafs’ veteran organist, Jimmy Holmstrom. The three names that appeared on both NHL and Leaf panels were author and broadcaster Brian McFarlane; Sportsnet reporter Christine Simpson; and former Toronto Star columnist Frank Orr. The Leafs decided to rank their players, which called for a bit more rigor in the process. They thought they’d throw in some democracy, too. “The One Hundred list is the result of rankings submitted by a 31-member committee made up of prominent members of the hockey community, including a public fan vote that counted as the 31st member,” the team explained. The ballot fans online saw offered up the names of 154 Leafs, divided up by decades. Some 300,000 votes came in that way. After it was all over, I talked to a couple of the panelists, informally. I wondered what guidelines they’d been given. Were there players, say, of short duration who, dominant as they might have been elsewhere in their careers, were too brief as Leafs to be considered? No, I was told, absolutely nyuh-uh. I don’t know, though. Maybe there was no official directive, but no-one was really going to make a case for Phil Housley, who played just four games of his 1,580 NHL games for Toronto, right? I mean, judged purely as a defenceman, Housley was a true great, as verified by the Hall of Fame. I think we can all get behind an objective determination that in terms of greatness his exceeded that of, say, Todd Gill, who features on the Leaf list at number 84. Nothing against Gill. I wish him well. Peace be upon him and his people. I salute his workmanlike service, and recall his yeoman years grimly persisting in defence of the Leaf blueline with … not joy, exactly. But I remember. He was a Leaf, by god, and for all his subsequent peregrinations — to San Jose and St. Louis, to Detroit and Phoenix, back to Detroit, down to Colorado, to Chicago, and Lausitzer Füchse — he remained a Leaf in the same way that Housley, for all his late-career wanderings, will always be a Sabre. Everybody understands this, if only in their bones, at a deep level to which language doesn’t reach. Nowhere but in Toronto was Todd Gill great; the greatness that Gill achieved in Toronto wasn’t like regular greatness they have elsewhere. It’s specific to the service Gill did in blue-and-white, suffering through the Harold Ballard years, playing for John Brophy, wearing that funny helmet he wore with a certain kind of dignity. So that’s why Phil Housley isn’t on the list. Same, I guess, for Frank Nighbor, whose greatness resided somewhere beyond the 22 games he played as a Leaf. Brian Leetch (28 Leaf games) too. The list of elsewhere-great Leafs goes on: Ron Francis (24 games), Eric Lindros (33), Joe Nieuwendyk (73). Nobody needs to justify their absences. I would take an explanation, if anybody’s offering one, regarding goaltenders. Nine of them made the Leaf cut: Johnny Bower, Turk Broda, Curtis Joseph, Harry Lumley, Terry Sawchuk, Lorne Chabot, Mike Palmateer, Ed Belfour, and George Hainsworth. It’s a sterling cadre, no question, anchored by five Hall-of-Famers. What a crew! Hail to you all! Not one of them could I easily argue to oust. I just wonder — well, Palmateer? I know, I know, he played a long time, was cheerful and beloved, put up manfully with Ballard & etc. I grew up watching him; he has my respect. 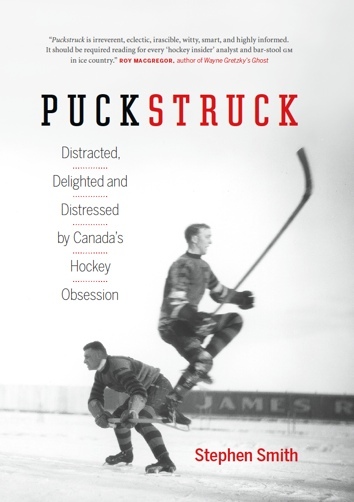 I can, if I squinch my eyes shut, work out for myself why he rates ahead of, say, a Hall-of-Famer and positional trailblazer like Jacques Plante, who (by the by) played more games as Leaf than Terry Sawchuk, though Sawchuk (of course) won a Stanley Cup with Toronto, in ’67, which Plante never did. I might just sit down here for a second, collect my breath. Not worth getting an ulcer worrying over this sort of stuff. Though — um — sorry — what about Frank McCool? He only played two Leaf seasons, just 85 games, it’s true, but one of them was spectacular. In 1944-45, with Turk Broda away at war, McCool not only won a Calder Trophy as the league’s outstanding rookie, he helped the Leafs to win the Stanley Cup. How does he not make the Leaf list? Or John Ross Roach? If I were going to make a stand, he’s the one I’d be making. Let the record show that if push came to proverbial shove, I would be stood all over J.R. Roach. If I were to litigate the Toronto One Hundred, his would be the case I’d prosecute. Nobody remembers him now, but his Leaf greatness is unimpeachable. I challenge you to impeach it. Well, mostly he was a St. Patrick; he only wore the maple leaf for two of his seven Toronto seasons. Same thing, though, right? And yet as accomplished and admired as he was in the hey of his day, his reputation failed to endure. It didn’t last. It just didn’t have the — well, whatever it is that keeps memories of hockey players alive and healthy, he was lacking in it. It’s a long time since he played, it’s true: there’s plenty of natural fading involved. In some cases, I guess, it’s just a bit more thorough. So entirely has John Ross Roach been effaced from the Leafscape that he didn’t even make the ballot for his decade when the for the One Hundred. I will say, as you gather your outrage to join it with mine, that while Roach wasn’t the first goaltender to backstop a Toronto NHL team to Stanley Cup championship, he was the second, after Hap Holmes got the job done for the Arenas in 1918. Roach was the first — not to mention the only — Toronto goaltender to captain the club. Before he was forgotten, he had lasting power, too. Pre-Roach, Toronto went tried out seven goaltenders in four years. Once he made his (slightly delayed) debut in 1921, he kept the Toronto net for seven years, playing 222 out of 226 regular-season games, along with a further nine playoff and Stanley Cup games. All told, he won 102 of these, registering 14 shutouts. He hailed from Port Perry, Ontario, 80-odd kilometres northeast of Toronto, on the Lake Scugog shore. “I’m the only boy from that little town to play pro hockey,” Roach was saying in 1929, and it’s still the case today, NHLwise. “Goaltending was sort of wished on me,” he told a reporter who wondered about his background. He played no hockey between the ages of 13 and 18, so the narrative goes: the Port Perry arena was destroyed by fire. It was when he moved to Toronto that he found his way back to the ice, with the junior Aura Lee club. What happened instead was that he signed for the NHL St. Patricks. The Globe now upped its valuation: Roach was “the best goalkeeper uncovered in the East since Quebec dug up Percy Lesueur,” advised The Globe. His NHL debut was delayed by injury. Five days ahead of the St. Patricks’ season-opener against the Montreal Canadiens, teammate Corb Denneny let go a shot in practice that dislocated Roach’s elbow. Dr. Jack O’Connor predicted he’d be ready to go, and he was wrong. Mike Mitchell played the first two games before Roach made his NHL debut in a Christmas-Eve loss to the Hamilton Tigers. He did better four days later, winning the return match. It was an eventful season, that first one. In a game against Montreal, he stopped 73 shots, only one of which got past him. In March of 1922, when the St. Pats overcame the Ottawa Senators in a two-game final to decide the NHL championship, he was the star. Toronto won the first game at home, 5-4. John Ross Roach stood out with the most masterful exhibition of goaltending ever shown locally. The wee lad blocked with stick, feet, body, hands, head, pads, and every conceivable manner. He turned down effort after effort that was ticketed through, and his great display alone saved the Irish. Having conquered the NHL, Toronto went west to play the Vancouver Millionaires for the Stanley Cup. Roach was again the star, outduelling the redoubtable Hugh Lehman in the Vancouver goal. The St. Pats returned with the Cup, though Roach finished the season as he’d started it, which is to say painfully injured. In the deciding game, a shot from Ernie Parkes — well, The Globe’s dispatch says the puck “found a lodging place right under Roach’s eye,” which I’m going to say might not exactly have been the case without denying that he suffered extremely. 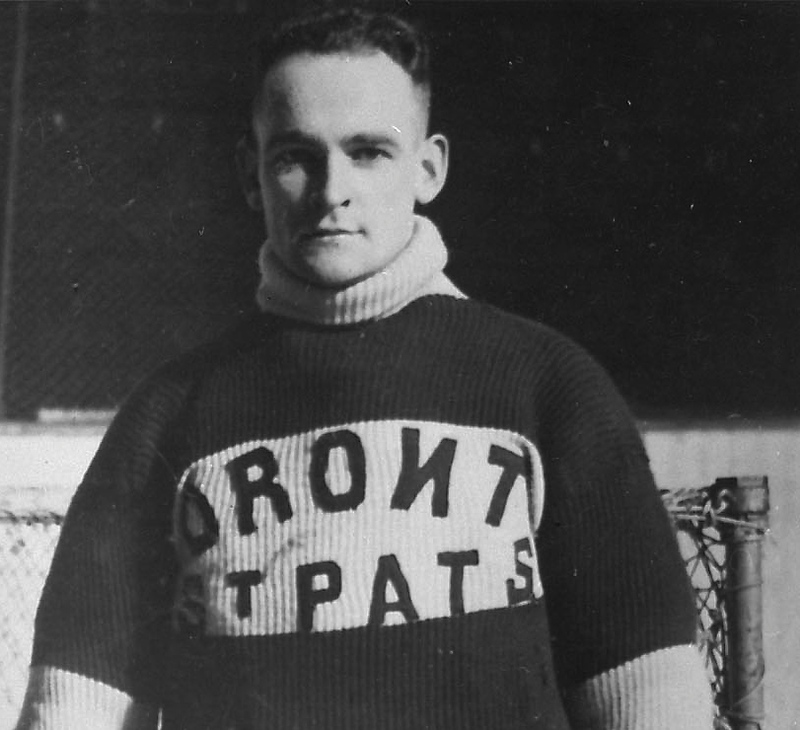 While Toronto couldn’t repeat the success of Roach’s first season, he continued as the popular mainstay of the Toronto nets through the mid-1920s. His captaincy lasted a single season, 1924-25, with Babe Dye succeeding him. 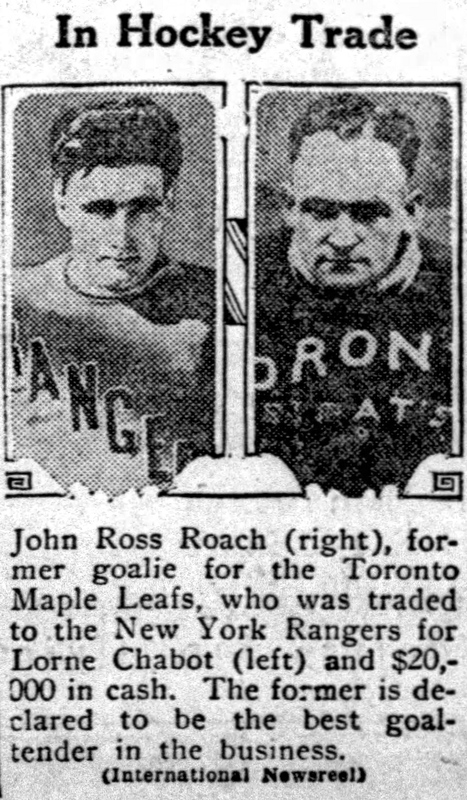 Roach was still the man in the Toronto net when the team transformed, in February of 1927, from St. Patricks to Maple Leafs. I ought to say, probably, that he returned to Port Perry in the off-season, where he tended a poultry farm through the summer of ’28, when he sold his property and moved to Toronto full-time. That was the same year he asked the Leafs for more money and the Leafs did what teams sometimes do when they don’t want to pay up: they engineered a trade. The New York Rangers had won the Stanley Cup in the spring of ’28, but in doing so they’d seen their regular goaltender, Lorne Chabot, fall injured. (The game he was felled was the famous one in which 44-year-old Rangers coach Lester Patrick stepped into the net.) Chabot recovered, but Rangers’ president Colonel John Hammond was suitably rattled by the injury to want to shed his goaltender for another. The trade he worked out brought Roach south for Chabot and $20,000. 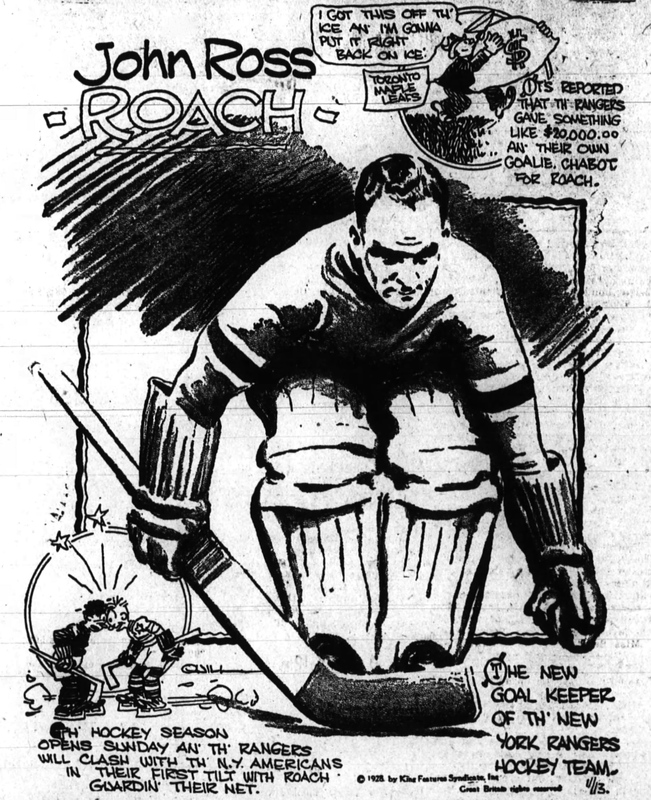 The Rangers felt that they were getting (to quote a contemporary wire-service) “the greatest goaltender in professional hockey.” They did make Roach the highest-paid backstop in the league in 1928. Both men were 28; otherwise the difference between them was sizeable. Roach, still 5’5”, was specifically reported to have dropped his weight to 123 pounds, while Chabot arrived in Toronto wearing his 185 pounds on a 6’1” frame. Chabot would play five years for the team, helping them to win a Stanley Cup in 1932 — a Leaf career deserving, no question, of a place in the team’s pantheon. As for Roach, he played another seven seasons, for the Rangers and Detroit, and while there weren’t any more Stanley Cups in his cards, he was effective and popular wherever he played. He named to the NHL’s First All-Star team in 1932-33.
the Port Perry chicken fancier.